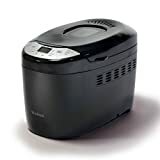 The West Bend 41410 Breadmaker is a mid-level bread machine. It has just as many features as some of the higher end models coming from brands like Zojirushi, but isn’t flimsily put together as some of the other lower end models. For example, many cheaper models tend to move around a lot when the machine is kneading dough. Some even move to the point where it “walks” off the counter and falls to the ground, breaking. The really cool thing about this machine is that it will make 3 loaf sizes. Most machines make only 1 or 2. But this machine will make either a 1.5-pound, 2-pound, or 2.5-pound loaf. That means it’s perfect for small to large families. Singles or couples will find that a 1-pound bread machine is enough for them. Small families of 2 to 4 people might make a 1.5-pound or 2-pound loaf. And with the West Bend 41410, you would be able to make a 2.5 pound loaf to feed 4 to 6 people. The bread machine comes with some standard features like any other machine. It has 12 pre-programmed settings including one for gluten-free. You can choose from 3 different crust settings. This machine will bake your bread in about 3 hours (most machines bake in about 2 hours but we’d like to think the extra hour is for the biggest loaf size) and it has a 13-hour delay timer. The West Bend 41410 comes with an instruction manual and recipe booklet, a measuring cup, a measuring spoon, and a removable bake pan with dual kneading blades – great for kneading the perfect dough. We had a good first impression of the West Bend 41410 after unwrapping. The design is sleek and looks almost futuristic. This is refreshing to see from all the other boxy bread machines. It looked great on our counter top and think it would match just almost any kitchen because of its sleek black color. Despite its futuristic look, the bread pan comes in a traditional rectangular shape so your bread won’t bake in an odd shape. On the LCD display, we found it a bit confusing to use at first because of the way everything is labeled. This machine does a lot. It has many functions. But West Bend couldn’t seem to figure out how to display things as simply as possible. The design is a bit cluttered all around the display and there are settings numbered 1 through 12 on both sides, making it seem overwhelming. So there was a bit of a learning curve to figure out how to use and read the menu. When we figured everything out and started to test the machine, we were impressed with the face that it doesn’t move around and is really quiet. So it’s similar to the expensive models such as Zojirushi in that respect, but for a much affordable price. We also like to mention that there are two kneading blades just like the Zojirushi PAC-20 and Zojirushi CEC-20. This seems to really help the bread bake up nicely. We found that it did a great job in baking all sorts of bread. We would rate it just below Zojirushi in terms of the quality of the bread, which would make it a really solid bread machine. The West Bend 41410 is a great mid-level choice. It makes 3 different loaf sizes compared to 2 on most low-level bread machines. A quiet machine, it is great for small and big families alike. Overall, we were happy with the design of the machine and the fact that it makes a traditional rectangular loaf of bread. We also liked that it was quiet. Although the menu is confusing to read (there is a bit of a learning curve), it has a plethora of settings. Given its features and functions, we think it’s a no brainer to pay a little extra than to purchase the less expensive models such as Sunbeam 5891 or Hamilton Beach 29881. Although it’s no Zojirushi, this is still a great choice. Does it have an alarm or beeping so you know when yo put in raisins etc…? Its so difficult to find a machine that has this feature which mine had before it broke. If you put the raisins in at the beginning they get too chewed up where as when there is a beep or alarm letting you know that it’s “time” they come come out perfectly shaped in the bread which makes it look so much nicer.